If the wiring harness that came with your project motorcycle is junked or became rat food while it was sitting you have the option of wiring the motorcycle yourself. If you’re just looking for the basics to get your bike running and street legal, you can create your own simple wiring harness to ensure your bike won’t experience any more electrical issues once it’s up and running. If you plan to reuse some of the existing components from your project motorcycle, take a look at the manufacturer’s wiring diagram and label the wires above with their correct colors. Enough new wire – 16 to 20 gauge stranded copper wire. New bullet (single, double, and triple) and fuse connectors – remember to grab male and female. Battery ground wire (4 to 6 gauge). Wire stripper and crimper. Automatic strippers make stripping and crimping connections a quick job. Heat shrink and a heat gun or wire loom wrap. 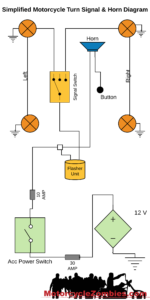 A regulator/rectifier combo unit to replace the separate units on your old charging system. New points and condensers OR an electronic ignition and proper coils. Once you’ve got the wiring roughed out on paper and everything in position, you can begin wiring your motorcycle. Connect your battery’s negative terminal to a clean, paint-free part of the frame. From the positive terminal, connect a wire(s) to your fuse box. This will serve as the power feed to your ignition switch, lights, and signals. Use a 30 amp fuse and run a wire from your fuse box to your ignition switch. From your ignition switch, you can run a power wire to feed your lights, turn signals, coils, etc. Depending on your switch/set-up, there may be different key positions for you to run power to just the lights and then to everything. You can either run a long wire that everything can splice into or multiple wire to different areas. Connect the positive wire from the headlight to the headlight switch and the positive wire from the ignition switch. Ground the other headlight wire. Attach the tail light to the power wire and ground it. The remaining tail light wire is for the brakes. Attach one cable from the power wire to each brake switch (front and back) and another wire from the brake switches to the taillight. 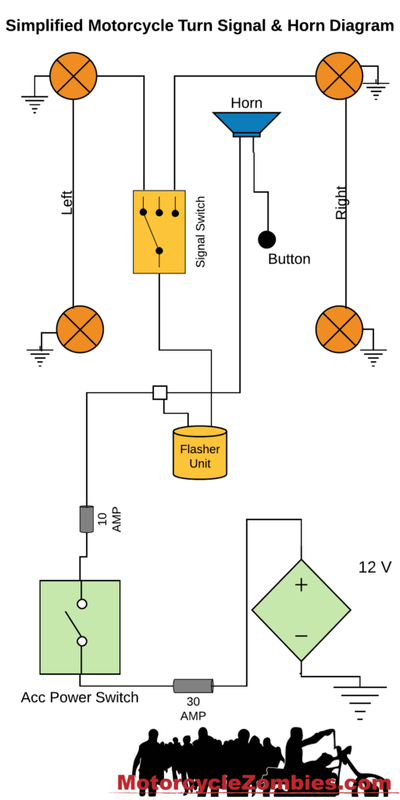 Connect a power wire to your flasher relay and from the relay to your turn signal switch. Attach your turn signals to the switch and wire the left side and right side signal together. Ground the signal lights to the frame. If you’re running an electric starter, connect another thicker wire from the battery’s positive terminal to the starter solenoid. Connect the larger wire from your starter motor to the other terminal on the solenoid. Connect one of the two wires from your solenoid to the starter button and the other to your ignition switch power wire. Connect one wire from each coil to the keyed power wire and the other to your electronic ignition or your points. Set up your kill switch between the ignition switch and the ignition coils. Connect the wires from your alternator to your regulator/rectifier unit. Connect the positive wire from your regulator/rectifier to the positive terminal on the battery and the remaining wire to a ground. To begin, it will help to already have the replacement electronics that you need. That way, you’ll know exactly which wires you’ll need to account for to work with you specific set up. 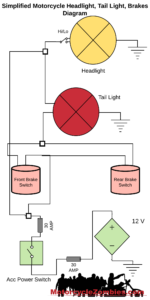 With your parts and materials in hand, begin with a sketch of what you’re wiring system will look like. Begin by drawing all the major components – battery, alternator, lights, ignition system, etc. – and begin tracing the power wire through each system. Once you’ve got the basic connections between each component traced out, you can color code it to keep it easier for yourself, depending on what color wire you’ve bought and what color wires are coming from your parts. It’s much easier to correct mistakes or identify problems on paper than after you’ve started cutting and crimping wires. 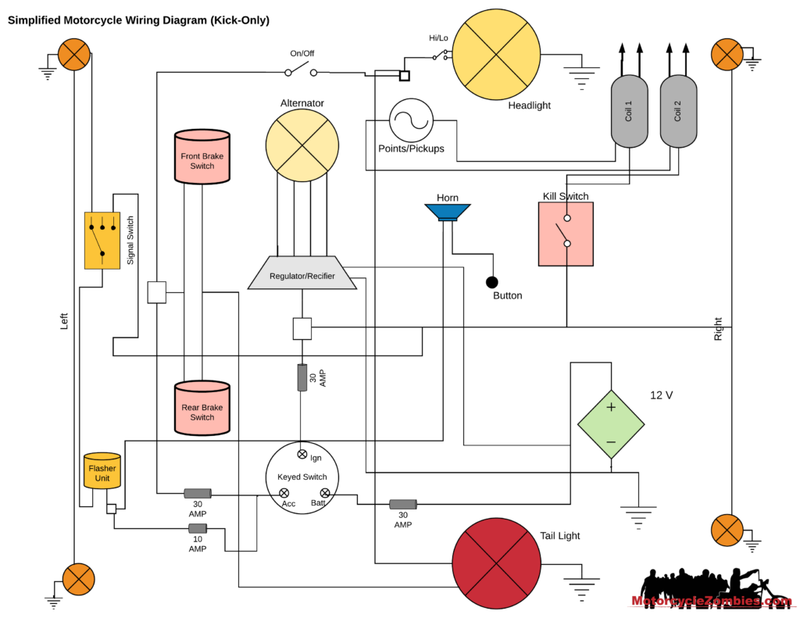 With your motorcycle’s wiring system planned out, you can start on the bike. Again, before you start cutting wires, it’s smart to actually place each component on the motorcycle to figure out where you’ll need to route each wire and how long it will need to be. With the wires roughly routed, turn the handle bars to see the limits. Decide where you’ll route the front connections and back connects and begin to get a sense of which wire you’ll be able to heat shrink together. Measure twice cut once holds very true for motorcycle wiring! If you want to add indicator lights or dummy lights in your gauges, you can follow the same logic as for the critical components above. Power from the keyed power wire to the component and ground as necessary. If you’re running a kick-start only, you can ignore the portion about the start solenoid and starter motor. When you’re running a no-battery motorcycle, you’ll need to wire your ignition switch from the regulator/rectifier and or capacitor unit between a 30 amp fuse. From the ignition switch you can run another smaller amp fuse to your lights. Be sure that each new connector is properly crimped and sealed with heat shrink/connection cover before you wrap up the entire harness. You can use heat shrink to keep the wires neat and route them with zip ties. Be sure to route your wires and harness away from the engine so it doesn’t melt. Double-check that your harness is not getting pinched by anything – seat hinges, gas tank, steering stem, etc. You can turn your lights, signals, etc. on while you turn your steering, lift the seat, and roll the bike to make sure nothing gets disconnected. Watch to be sure the wires are not getting too tight as you go through your checks.